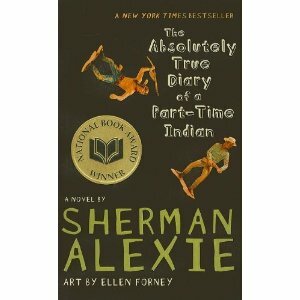 The Absolutely True Diary of a Part-Time Indian by Sherman Alexie is SDSU’s Common Read book for 2012. The choice was revealed during a special party at the library on May 1st. Attendees enjoyed refreshments and received free copies of the book courtesy of the library. This is the fourth year for SDSU’s Common Read. Previous selections were Outcasts United, Mountains Beyond Mountains, and Three Cups of Tea. Many students enrolled in First Year Seminar courses will be reading and discussing the current selection this fall. A slate of activities centered on the book and its subject matter will be announced later. The library is embarking on a remodeling project in our Technical Services area, on the west side of the building. Remodeling and rearranging staff members’ work areas will provide room so that the Department of International Affairs can relocate here in the fall. While construction crews are working, you will see items stored around the library and staff members making due with temporary offices. Many Technical Services staff members are sharing tight quarters in Room 105. Archives & Special Collections on the library’s upper level has a remodeling project of its own. This project, scheduled for completion around April 30, will result in improved study space for the Daschle collection and an increased capability for meetings. By Presidential Proclamation October is National Information Literacy Awareness month! In today’s digital world, people who are information literate know how to find, access, and critically evaluate information to improve their health, environment, education, and productivity. Having this skill set empowers us to make informed decisions about our lives and, in essence, take more responsibility for our individual welfare and that of the nation. Take a few minutes to recognize and appreciate the information literacy skills that you use every day. Try to imagine what your life would be like without them. If you have any questions about what information literacy is or feel that your skills aren’t up to par, stop by the Information Services Desk and chat with a Librarian. We would be glad to help you out! A retirement reception will be held for Dr. David Gleim, Dean of Libraies, on Wednesday, June 15, 2:30 – 4:00 pm. Please join us in the Recent Fiction area on the main level of Briggs Library for toasting, roasting and refreshments. Dr. Gleim has been active in the South Dakota Library Association and currently serves on the SDLN Executive Committee. He also sits on the Friends of the Brookings Public Library Board and on the Board of the Wegner Health Sciences Information Center. When not sitting on a board or standing at his desk in the dean’s office, he is a running enthusiast who has competed in local and regional marathons and half-marathons. He also spends time in the classroom at SDSU improving the Spanish skills he needs when traveling in Mexico where he and his wife plan to live following their retirements. His staff and colleagues at SDSU are grateful that he chose Briggs Library as the place to end his long and productive library career. We hope to see you in the library for this celebration on June 15th! Library staff members are pleased to report that we will install two new black and white laser printers this fall. This summer we are making due with one black and white printer and one color printer. In addition to these printers found in the library’s lobby, users may print from the computer lab located on the library’s main level. The library will continue to subsidize printing and keep the prices at $.05 per page for black and white copies and $.15 per page for color copies. 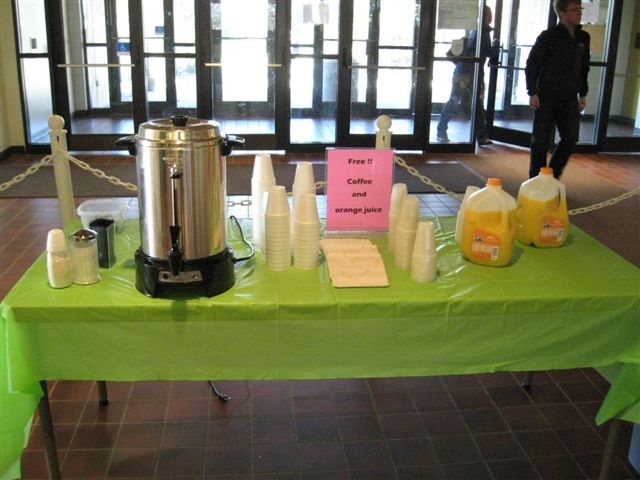 These appealing beverages were available in the library’s lobby this morning. Check out the post below for details about morning and evening study breaks during finals week. It’s become a tradition for Briggs Library staff members to host evening study breaks during finals week. This semester, Briggs Library will hold morning study breaks as well. Enjoy coffee, cookies, and lemonade to help keep you going. Refreshments will be offered Sunday, Monday, & Tuesday, May 1-3, starting around 7 p.m. in Room 105 of the library. Enjoy a morning pick-me-up of coffee or juice on Monday, Tuesday, & Wednesday mornings, May 2-4, starting at 8 a.m. in the library’s lobby.